Buddhists, Hindus and Muslims gather amicably at the Kataragama festival. 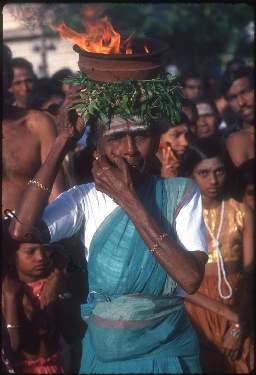 A woman devotees carries a pot of burning camphor on her head (above) while another devotee has his cheeks pierced by a miniature spear (below). 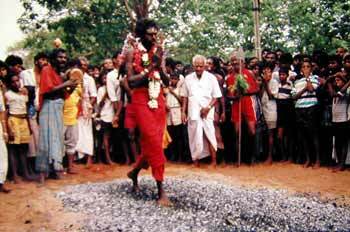 KATARAGAMA, Sri Lanka - Young boys in loincloths writhe on hot sand, men skewer their tongues and others walk barefoot on hot coals -- all in praise of their god. In a country at war with itself for 16 years and divided on ethnic lines, this is where old hatreds are forgotten in the climactic end to a pilgrimage that appeals to all Sri Lankans. The devout, including Hindus, Buddhists, Muslims and even Christians, come to Kataragama, an ancient pilgrim center in southern Sri Lanka, each July to seek blessings, divine advice and miracles. The pilgrims want the gods' help to end drought, safeguard their homes, cure illness or drive out evil spirits. "There has to be some truth about the belief that God Kataragama can deliver miracles because people have been worshiping here for centuries," said Yasasiri Kasthuriarachchi, chief trustee of the Sinhala Buddhist temple in Kataragama. The pilgrim center, partly built in the second century BC during the reign of Sinhalese King Dutugemunu, is one of a few places where Sri Lanka's major communities gather in worship. Since 1983 rebels from the mainly Hindu Tamil community have been fighting for an independent Tamil homeland in the north and east. They say they face discrimination in education, employment and land distribution by the majority Sinhalese. Kataragama is 113 miles southeast of the capital, Colombo. 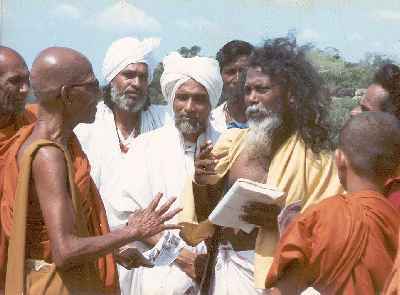 Many years ago it could only be reached by traveling through dense jungles, but as the number of devotees grew the jungle along the river Menik Ganga was cleared so that they could make their pilgrimage annually. "I come here every year to honor a vow that I made to safeguard my vehicle," said Jagath Mahindasiri, from a distant village, as he entered the shrine with an offering of fruits. Thousands of others smashed coconuts, lighted incense sticks and made various offerings after standing patiently in a queue that wound itself around the large complex. For the Hindus there are many deities but the most famous is Skanda, also known as Murugan. The Buddhists worship at a temple or dagoba known as Kirivehera, while the Muslims flock to a mosque that has been built at the pilgrimage. "Kataragama is considered to be exactly on par with making a pilgrimage to Mount Kailash in remote Tibet, which is considered by both Buddhists and Hindus to be of the highest merit," Manik Sandrasagara, a trustee, wrote in a newspaper. At night the devotees, representing a spectrum of Sri Lankan society, share food in the glow of campfires to the chants of praise passed down from elders to children. At sunrise, many thousands bathe in pools along a river valley before making their way to complete their pilgrimage. In one act of devotion, two young boys roll on scorching sand to the cries of "Haro Hara" (praise the lord). Then the big crowd watching them parts like a breaking wave as the two boys, wearing only loin-cloths, move toward a Hindu temple. 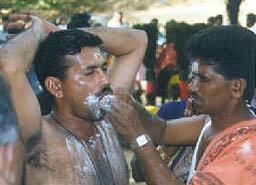 Some devotees skewer their cheeks and tongues with miniature spears, while others suspend themselves on hooks in their flesh. Hundreds of parents shave the heads of their children before bathing them in the river and taking them to the shrine. 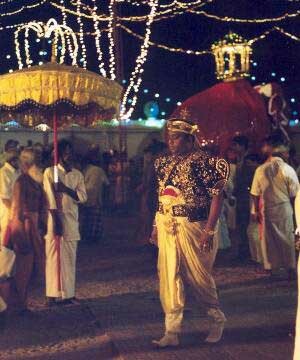 Some pilgrims carry on their shoulder a decorated, arched frame known as the "kavadi" from their village, but the most famous spectacles of Kataragama come when men, women and even small children walk barefoot over a bed of burning embers.  The acts of self-mortification are confined to a minority, mostly Hindus, some of whom trek more than 60 miles through a wildlife park to reach Kataragama. "Although all are pilgrims at the festival, those who have made the pilgrimage by foot have the power to bless those who have not," said Sandrasagara, a trustee of the Buddhist temple. On the final night of the 16-day festival dancers, drummers and elephants parade around the pilgrimage to the blowing of conch shells, beating of drums and chants that fill the night.